If you don't know how to install it, we suggest you to find a professional technician to do for you. Installation guide is not included. Please be sure you know how to install it before buying. Please check the item before you start to install it. If there is anything damaged, please take photos and send to us, we will solve it for you. Otherwise, we are not responsible for any damage caused by installation of this replacement parts. 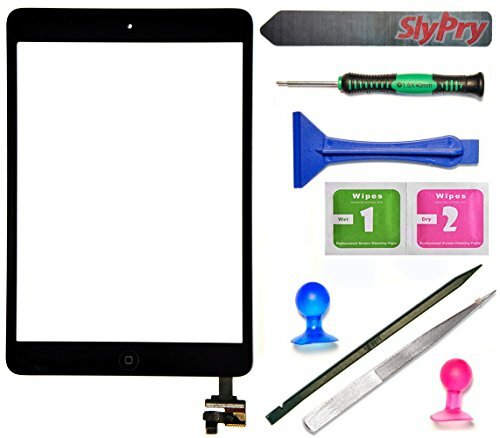 Prokit Black ipad mini replacement digitizer repair kit includes IC chip and Home button and tool kit with SlyPry opening tool PLEASE FAMILIARIZE YOURSELF WITH THE PROCESS BEFORE ATTEMPTING IT YOURSELF: We cannot accept any responsibility for any damage incurred during the replacement process. 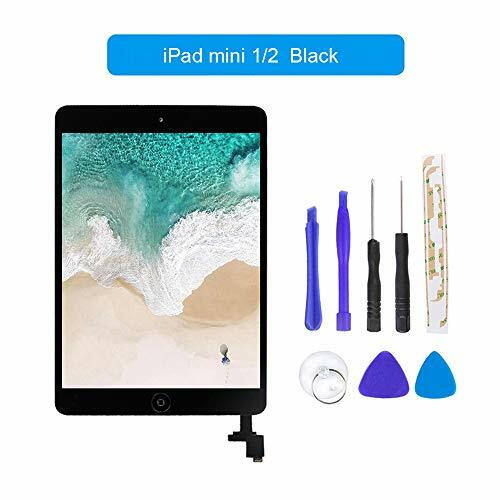 This item only will work with the ipad mini version 1 or 2.
ipad mini 1 or 2 digitizer replacement kit for ipad mini version 1 or 2 in black is fully compatible with the ipad mini with retina display. 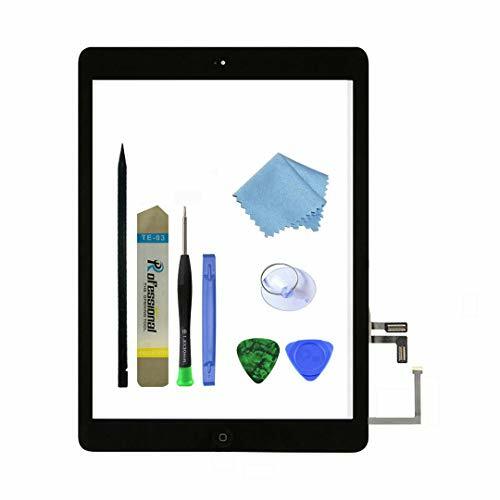 ipad mini digitizer with IC chip, home button and adhesive are pre installed to make your install quick and easy. 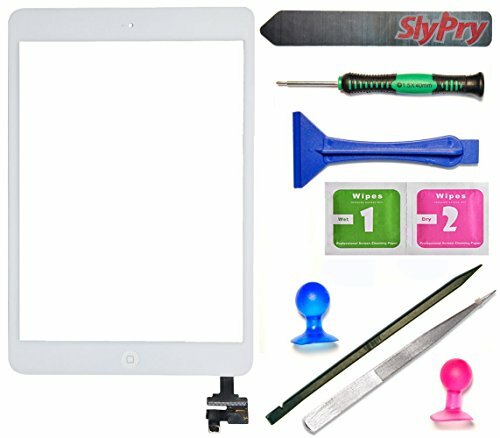 Prokit White ipad mini replacement digitizer repair kit includes IC chip and Home button and tool kit with SlyPry opening tool PLEASE FAMILIARIZE YOURSELF WITH THE PROCESS BEFORE ATTEMPTING IT YOURSELF: We cannot accept any responsibility for any damage incurred during the replacement process. 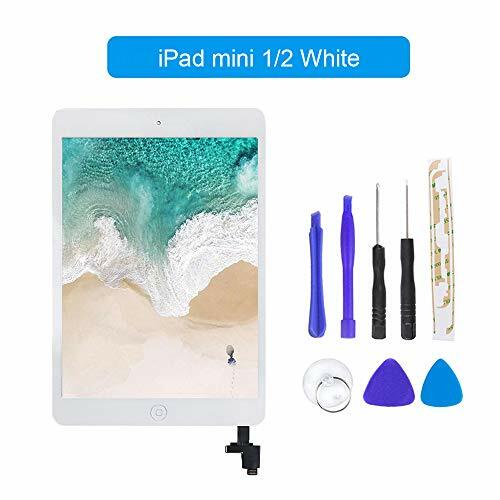 This item only will work with the ipad mini version 1 or 2.
ipad mini 1 or 2 digitizer replacement kit for ipad mini version 1 or 2 in white is fully compatible with the ipad mini with retina display. 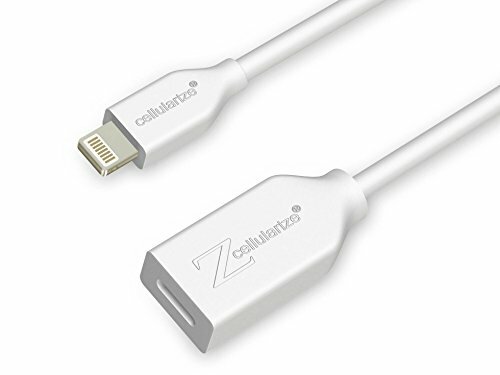 Compatible with both iPad Mini / iPad Mini 2. Model Numbers (can be found on the back of the iPad): A1432, A1454, A1455 A1489 A1490 A1491. NOT included Instructions,but there's many instructional videos on YouTube. 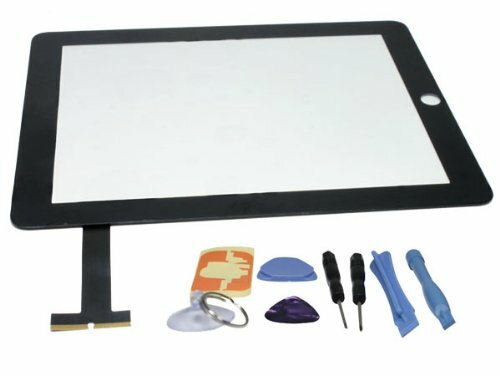 DO NOT glue touch screen with your ipad until you TEST and make sure it works with your ipad. 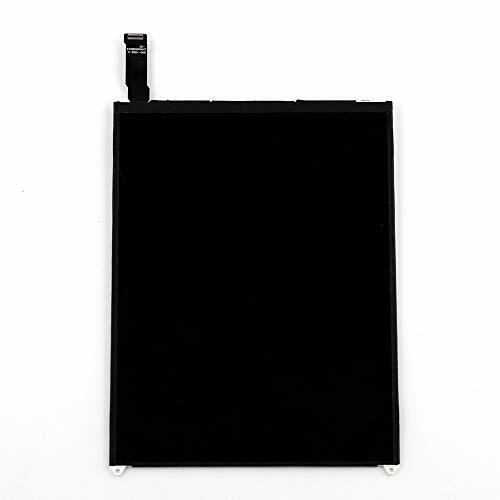 Compatible with iPad mini A1432, A1454, A1455 A1489 A1490 A1491. 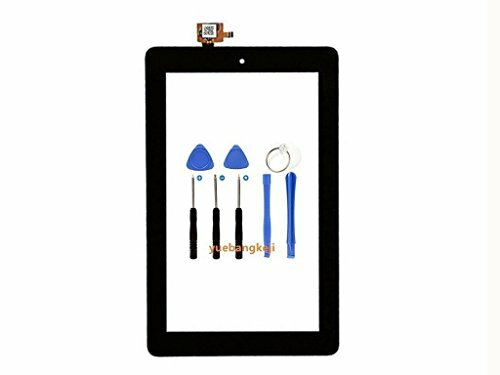 Free Middle bezel and Wifi Antenna offered,When you remove your old screen they are easy damage but no worry we have a replacment for it. 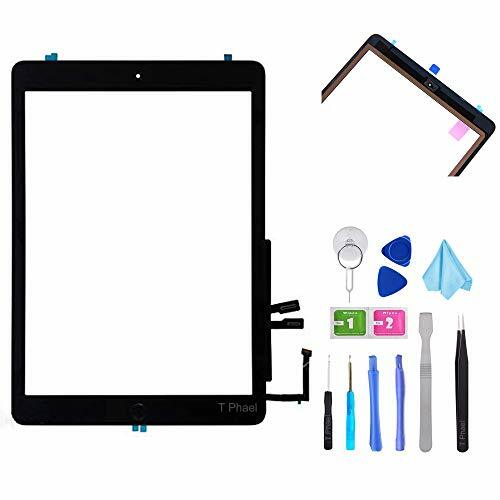 Zentop Black IPad Air 1st Generation Touch Screen Digitizer Glass Replacement Modle A1474 A1475 A1476 with Home Button,Camera Holder,Preinstalled Adhesive,Tool Kit. 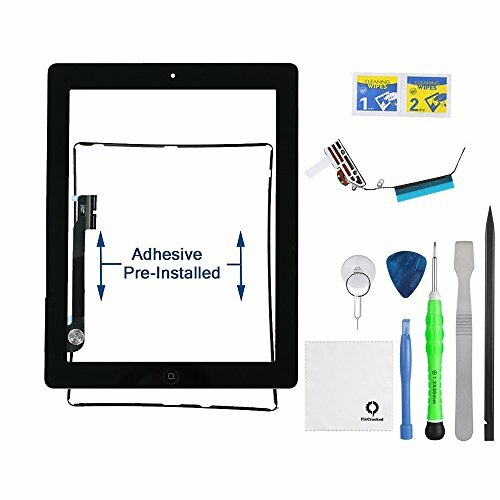 This premium IPad Air 1st touch screen is the perfect replacement for cracked screen/glass or non-functioning / unresponsive touch screen. We only use components that are identical or very similar to those used by the original manufacturer. 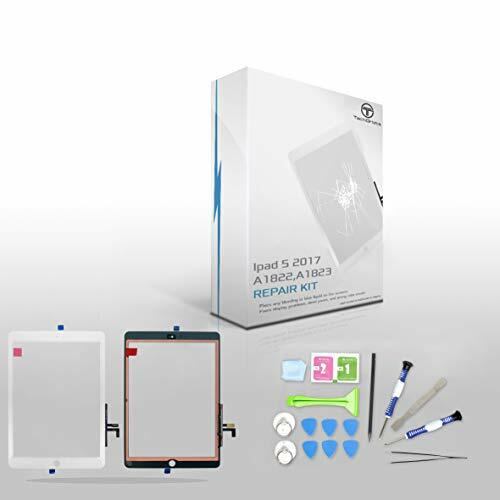 We hope that your ipad can be restored to a completely new state. 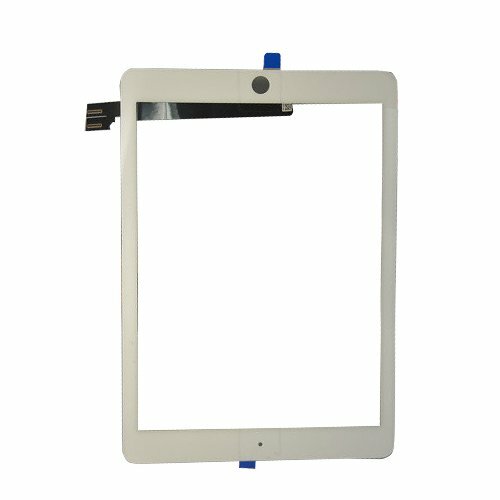 *PLEASE NOTE* This is a replacement digitizer for the iPad Air 1st . The LCD screen is not included. 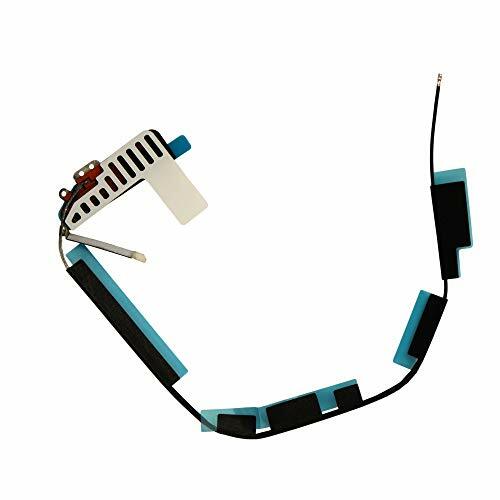 Compatible with all iPad Air Models A1474 A1475 A1476 WIFI GSM CDMA High quality product! If you don't know how to install it, we suggest you to find a professional technician to do for you-parts damaged during installation are not accepted for return. Installation guide is not included.We recommend that you watch online video installation on youtube or consult professionals for help to ensure a successful installation. For any inquiries regarding the product or service, please contact us and we will do our best to solve your problem within 24 Hours.Thank you for your co-operation. 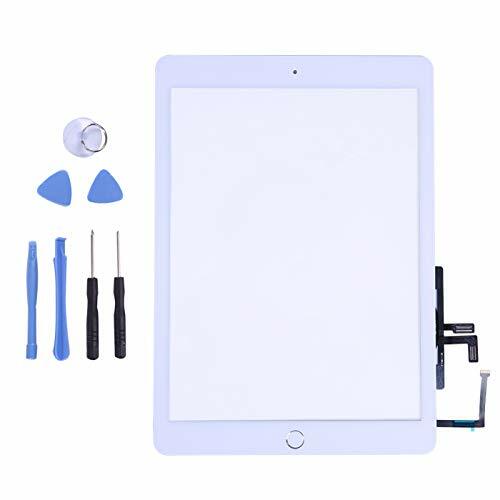 Compatible only with IPAD Air 1st Generation A1474 A1475 A1476 ,IMPORTANT: Please check the Model Number before purchasing this Item. You will find the Model Number on the back of your device. 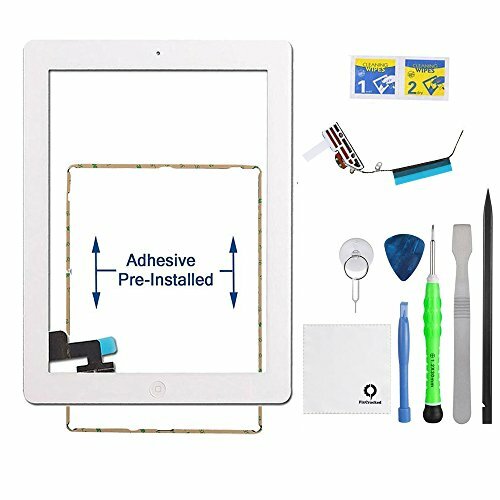 Glass Screen Digitizer Complete Full Assembly for iPad Air 1st Generation with Home Button, Camera Bracket and preinstalled adhesive. 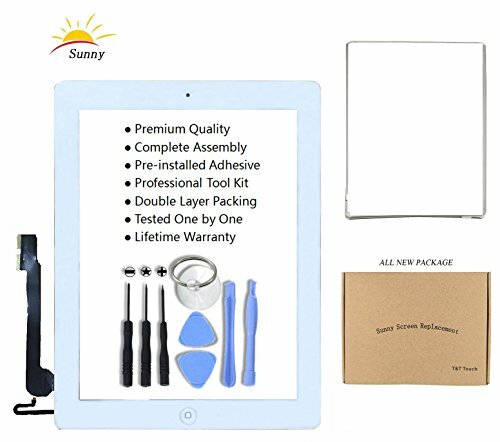 Tool kit allows you to easily replace your old iPad Air 1st Generation screen on your own | Brand New and high quality Digitizer - will ship in protective box. Note: not included Instructions,but you can search much videos on YouTube. 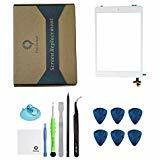 Incompatible cases: iPhone 5 Otterbox Armor, iPhone 6 & 6 Plus LifeProof fr & n d.
Brand New High Quality Digitizer Touch Screen Replacement(Double Layer Structure),each item has been tested and in good condition before shipping. No instructions included. Professinal skills needed for installation. We won't responsible for the damage due to bad installation. 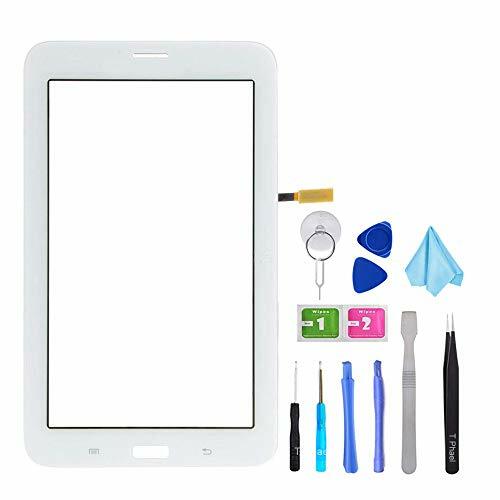 Well packed by strong box to protect the fragile touch screen digitizer,saving you money and time. 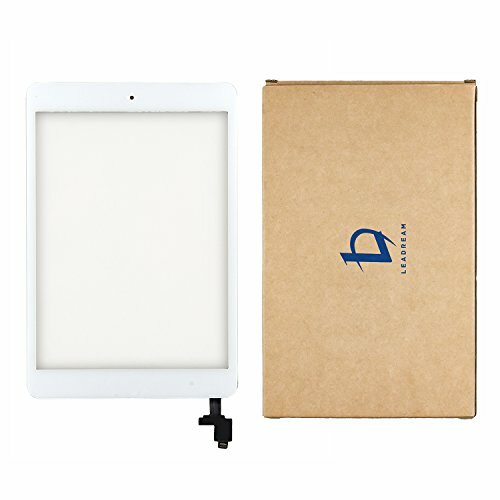 Capacitive touch control and has vertical and Horizontal image flip function. Image 4: 3/ 16: 9 display format conversion. Operating voltage: 12V 1a power supply current requirements within the above 2a, on board 400mA DC-DC Boost Regulator to provide power supply to LCD backlight. Support 864 x 480 x 24bit Graphics content through SSD1963 controller. It also equips parallel MCU interfaces in different bus width to receive Graphics data and command from MCU. Its display interface supports common ram-less LCD driver of color depth up to 24 bit-perpixel. Warning: all data port voltage can not exceed 3.6V. Supports BB black, comes with related images like: Angstrom. And also supports banana Pi/banana Pro, comes with related images like: lubuntu, Raspbian. We provided CD Disk with related driver and sauce code to you, If you are unsure about any of the technical issues.Please contact us freely. Protection case with 3x heat sinks> designed specially for Raspberry Pi 3 model B; full access to all controls and features. 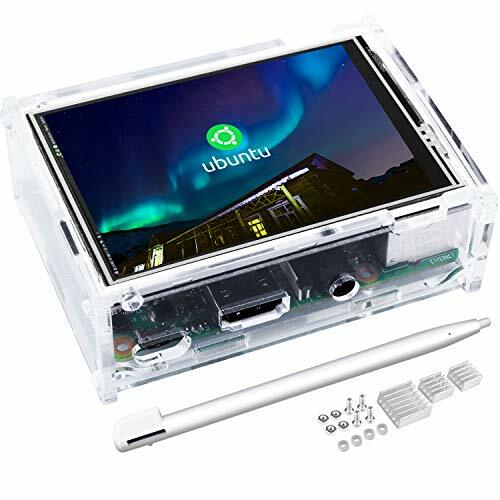 The protective case consists of five-piece PMMA enclosure that snaps together around Raspberry Pi 3 model Provides the best available protection/accessibility for model protect and secure your raspberry Pi from shocks, scratches and dust. The 3.5 in touch screen can support two screens simultaneous display(the Raspberry Pi can be connected to this screen and another HDMI screen at the same time). The Raspberry Pi screen can work with fbcp software driver, you can adjust the resolution by the software (The RPI screen original resolution is 320 480). The Raspberry Pi Display support 125MHz SPI signal input, It can display stable without Flicker. When it work with Raspberry Pi, the refresh rate is about 50fps, it is enough to play the video and game. 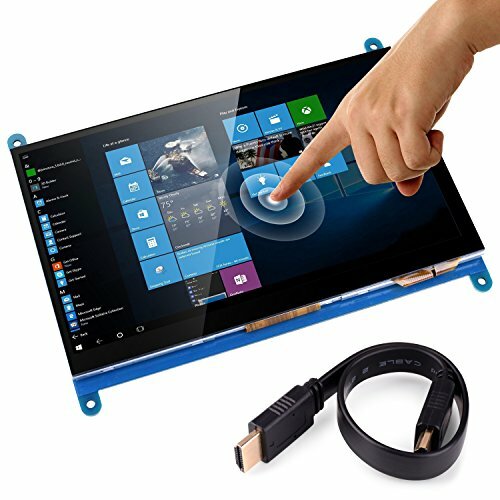 This LCD display comes with the PC protective case, which protect your raspberry Pi from Raspberry Pi from shocks, scratches and dust. 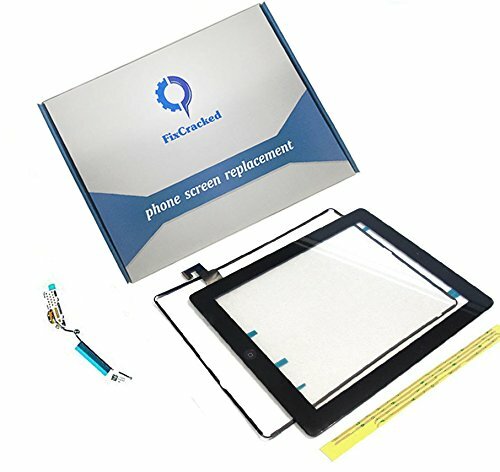 Free Middle bezel offered and Antenna,When you remove your old screen they are easy damage the bezel but no worry we have a replacment for it. 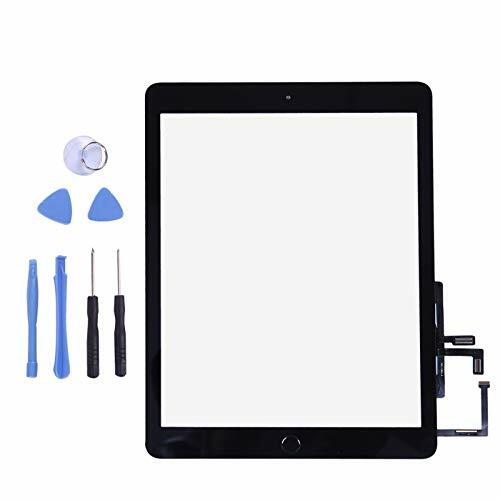 Touch Screen Replacement For Ipad Pro 9.7" A1673 A1674 A1675 Please confirm the model before order.!!! Only the touch screen,not include the LCD. Here we can offer some troubleshooting steps. 1)First,Please check the item are intact when the customer begin to install. 2)Checking the item and cable,Because the item is Fragile Products.It's easy to break and can't mend after breaking. 3)Becasuse we haven't offer the manual,we suggest that customer find a install video,Then who can follow the install step. 4)Make sure the cable Installed correctly,Avoiding the flash or black happen. 5)If the item still not work,Please contact us and we will offer a after-sales service. Provides EXCELLENT After-sale service,Please feel free to contact us when you have any questions we will offer a after-sales service. Repair Guides are not available, but many repair guides are available on Youtube.You also can contact us for help. We always recommend a trained technician use it. If you can't install it by yourself, please find trained technician for help. 100% customer satisfaction is our goal. Any problems, please contact us before leaving negative feedback, we can solve it for you. Thank you! 30 Days Money Back Guarantee. Any questions, please feel free contact us. Kit comes with Necessary High Quality DIY free tools for repair. 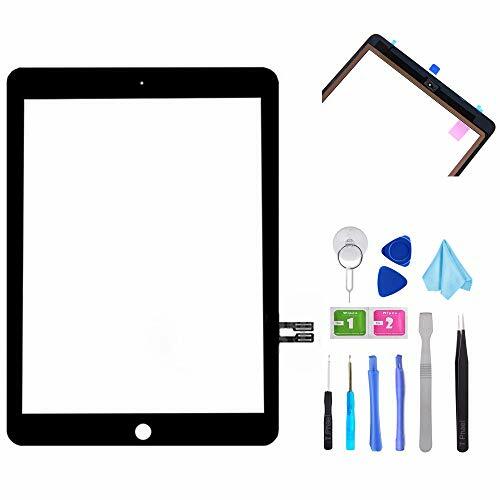 Compatibility:This part will only compatible with an iPad Mini 3, but not any other iPad Model. Please make sure you identify your iPad correctly before purchase. 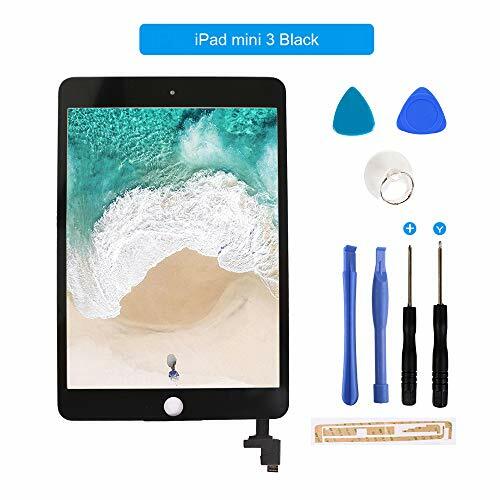 - Please search "iPad mini 3 replacement" on YouTube for a video instruction of how to do the replacement. 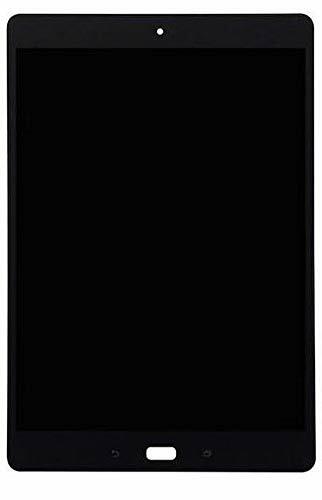 Made exclusively for iPad Mini 3 models: A1599 A1600 , but not any other iPad Model. 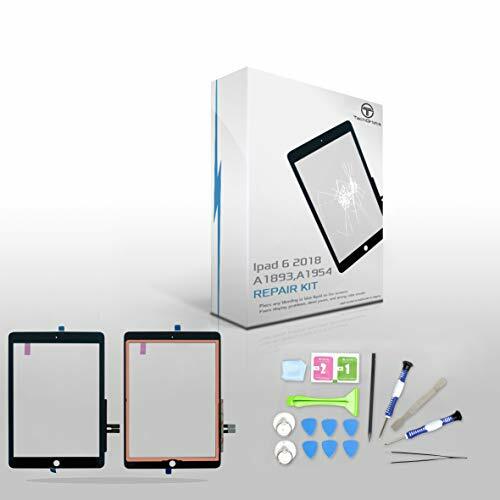 Repair your damaged/broken/cracked/shattered/Non Responsive iPad Mini 3 screen with this set. 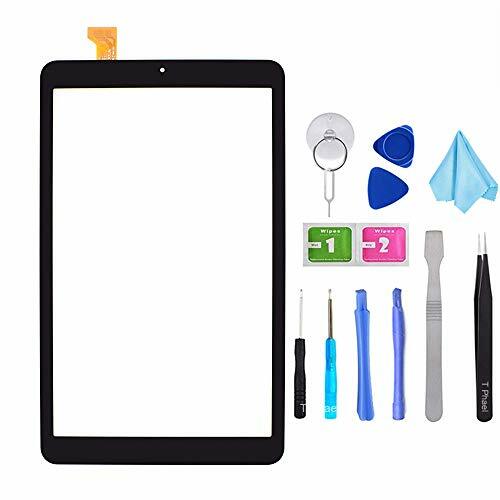 - Please search "iPad mini replacement" on YouTube for a video instruction of how to do the replacement. 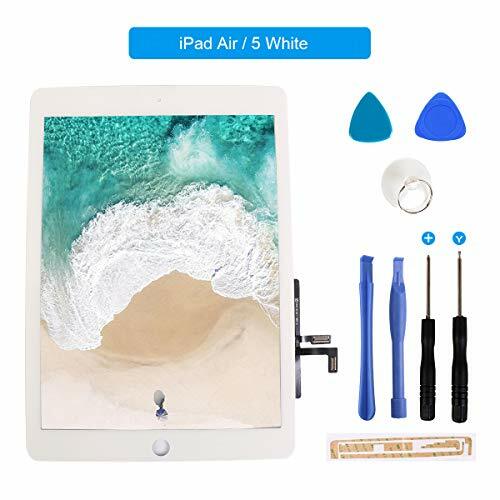 Made exclusively for iPad Mini 1 models: A1432/A1454/A1455 and iPad Mini 2 with Retina Display models: A1489/A1490, but not any other iPad Model. 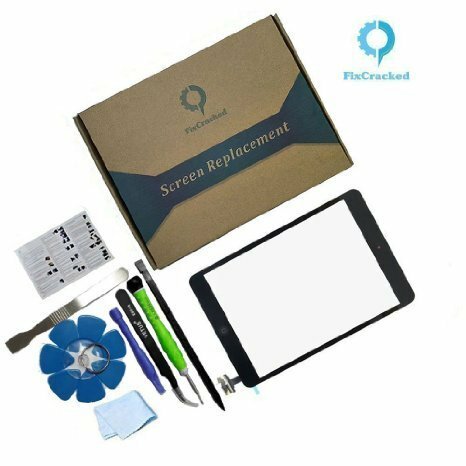 Repair your damaged/broken/cracked/shattered/Non Responsive iPad Mini 1/2 screen with this set. 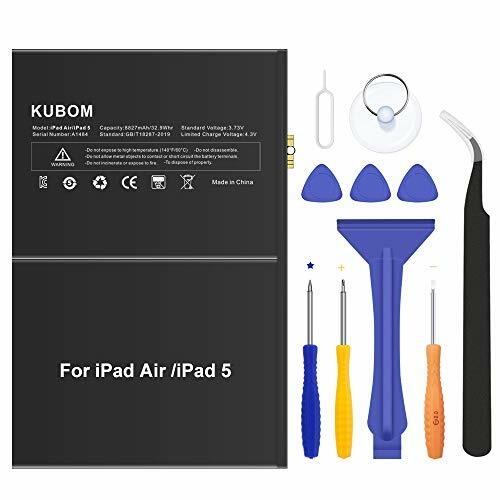 Compatibility:This part will only compatible with an iPad 5 or iPad Air 1st, but not any other iPad Model. Please make sure you identify your iPad correctly before purchase. 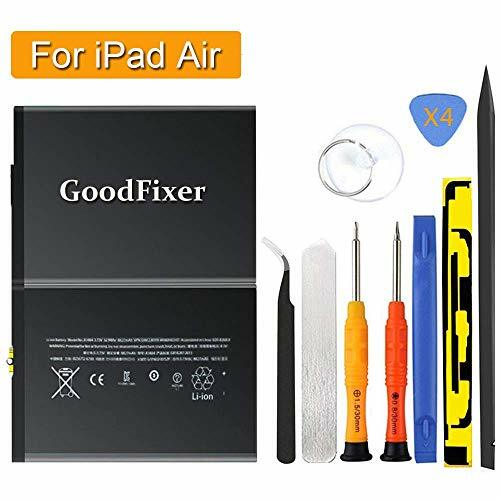 - Please search "iPad 5/ Air replacement" on YouTube for a video instruction of how to do the replacement.